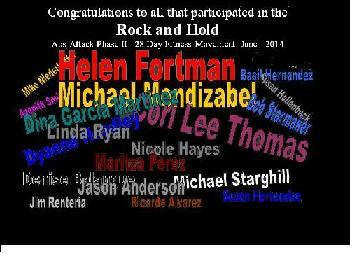 Thank you to all that participated in the Free Friends Helping Friends Wide Area Fitness Movement that I had named Rock and Hold Abs-Attack. This unique event was for 28 days and ended on June 30, 2014. Keep on working out and get ready for more exciting events to come. For all local bay area California residents get ready to get your fitness groove on at the 3rd Annual Reciprocal Energy Fitness Run, Jog, Walk event to take place on Sept 27, 2014. Register Today! Rock and Hold Ab Attacks Has A New Challlenger. 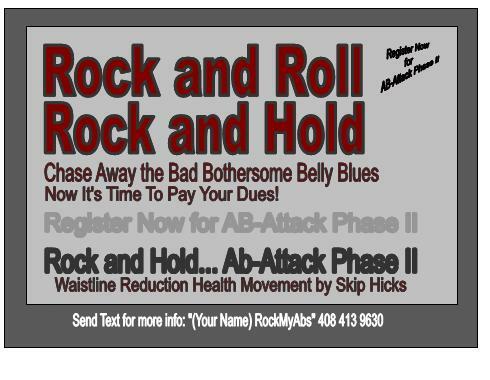 Rock and Hold Ab Program. Reciprocal Energy Fitness by Skip Hicks. Please LIKE this post to help promote a healthier more fit world that knows how to take action towards protecting their health while they still can. Let’s support Cori and the other Ab-Attacks challengers. This fitness program is both a philanthropic and marketing effort to reach and help individuals on a mass scale utilizing our modern day high technology devices. Whether you are a recreational sports enthusiast, someone wanting to lose weight, or you would just like to get into better shape, this program can help. Be involved in the Ab-Attacks program also gives you the chance to help others through collective wide area group motivation. Find out more about this exciting and innovate program that is helping many people get in shape and feel better by combining exercise, good will, and modern technology. Just text “(Your Name) info ab attacks” to: 408 413 9630. Please Like Reciprocal Energy Fitness on facebook by clicking on the image above. Reciprocal Energy Fitness by Skip Hicks is a great program that promotes a balanced holistic approach to fitness. Clients receive an initial assessment to see how their current fitness level compares to established norms. Exercise recommendations are then given focusing on cardio competency, strength development, and flexibility improvements. Clients also receive expert instruction in proper form and exercise execution using a variety of tools. Skip additionally provides clients with goal attainment counseling and strategies to help ensure their success. Nutritional counseling and monitoring is another important part of the Reciprocal Energy Fitness program. Check out Reciproal Energy Fitness by Skip Hicks. 408 413 9630. Follow Reciprocal Energy on facebook, LinkedIn, and twitter. 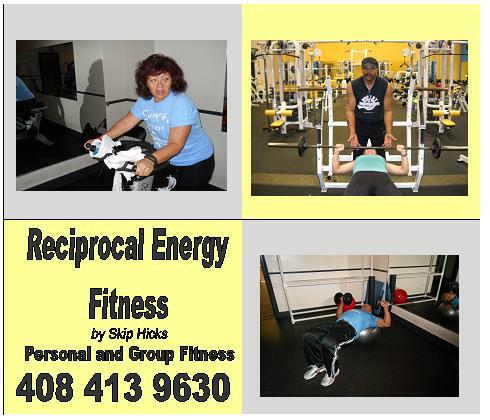 Reciprocal Energy Fitness by Skip Hicks focuses on physical fitness and personal empowerment. Community Fitness Event Helps Fight Diabetes! Reciprocal Energy Fitness trainer helps diabetes sufferers. The Reciprocal Energy Fitness 2nd Annual Fun Walk, Jog, Run event was a great success. More than just a community recreational activity it was also a fundraiser that allowed me to deliver a cashier’s check of $250 to the American Diabetes Association. Keep your eyes peeled for the next one (the 3rd Annual) as well as other upcoming events from Reciprocal Energy Fitness by Skip Hicks. An extremely dynamic, scientifically based, educational, varied, fun, mind and body strengthening program for both men and woman.